What are the best Roth IRA mutual funds? That's a great question, because mutual funds are a popular investment vehicle for your Roth IRA. But before you dive into the world of managed funds, you need to know exactly what you're getting into. Because a lack of information can lead to poor investment performance and years of costly fees. The best Roth IRA mutual funds are index funds, NOT actively managed funds. So what are the best mutual funds for your Roth IRA? "Our next guest is Mr. John Q. Public, billionaire mutual fund investor..."
Personally, I've never heard of a single self-made billionaire who gained billionaire status by investing in mutual funds. "Our next guest is Mr. Cornelius Vanderbilt XVII, billionaire founder of XYZ mutual fund company..."
If you watch CNBC or the financial news networks, you've probably heard this intro more times than you can remember. Unfortunately, it's not mere coincidence. Most mutual funds exist to make money for their managers and their parent company - not you. Think that's a little harsh? Maybe a bit of an overstatement? Well, depending on what source you consult, between 80% and 90% of actively managed mutual funds fail to keep pace with the market averages. That means putting your money in a simple index fund which mimics the market average has an 80% to 90% chance of performing better than an actively managed mutual fund. As if that news isn't bad enough, it gets worse. All of those underperforming mutual funds charge you a fee to lose your money! Typical fees for an actively managed mutual fund currently average 1.5% of your assets. Again, this is far more than an index fund or a broad market exchange traded fund (ETF). So, essentially, most actively managed mutual funds overcharge you for the privilege of losing your money. Generally speaking, the best Roth IRA mutual funds aren?t really mutual funds at all. The best Roth IRA mutual funds are really index funds. (We?ll find out why in a minute). But, needless to say, I would never recommend an actively managed mutual fund to anyone. Unfortunately, in some retirement accounts, you don't have a choice. Quite a few company-sponsored 401k programs limit your investment options to a small group of actively managed mutual funds. When this happens, there's not much you can do. However, when you do have a choice, which you do with your Roth IRA, you should never invest in an actively managed mutual funds. Think that sounds a little harsh? It is, but it's not without reason. Keep reading, and I think you'll understand why I feel this way. 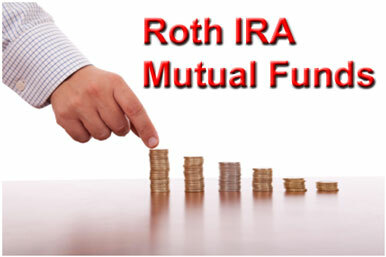 Should you invest your Roth IRA in mutual funds? The following comparison illustrates how a typical actively-managed mutual fund kills your long-term investment returns. In our first example, your money is invested in the most popular non-actively managed exchange traded fund (ETF), the SPDR Trust (SPY). This fund generally corresponds to the price and yield performance, before fees and expenses, of the S&P 500 Index. In doing so, it charges an expense fee of 0.08% of net asset value. That's a 23.6% difference in your retirement, or in this case, $26,245.81...! Not only is that a big difference, but the comparison assumes your actively managed mutual fund is able to keep pace with the market average... a feat which 80% to 90% of all actively managed mutual funds fail to do. Under such circumstances, can anyone make the argument you should invest your Roth IRA in mutual funds? By now, you might take exception with my assertion that you should never invest in mutual funds. After all, what about the 10% to 20% of actively managed mutual funds that do beat the market? First of all, those mutual funds have to beat the market by almost a full percentage point each year, just to break even on the after-expense return offered up by the market index fund used in our example. I'm smarter than most people, so I'll just do some research and pick one of the few mutual funds which consistently beat the market by several percentage points. If you're willing to spend time researching individual mutual funds, why not spend your time researching individual stocks so you can make your own investment decisions? If you're capable of picking winners and losers in the mutual fund industry, why not pick winners and losers in other industries as well? Just avoid the expense fees altogether and become your own portfolio manager! After all, you have several major advantages over the fund managers. In order to protect individual investors, the government places restrictions on actively managed mutual funds, hampering the ability of mutual fund managers to beat the market averages. In addition, Wall Street puts enormous emphasis on generating high short-term investment returns, often at the expense of long-term results. These and other factors combine to create an industry that generates consistently poor investment returns. 1) Forced "Diversification" - Federal law requires most mutual funds to have a certain level of diversification. At the time of investment, no more than 5% of a fund's assets may be invested in any one issuer's security. Most own far more than that, and returns suffer as a result. For example, let's say the stock of The Coca-Cola Company (KO) dropped 99% in a single day, and yet, the fundamentals of the company's business remained intact. But, due to federal law, a mutual fund can only invest up to 5% of its current assets in Coca-Cola at this once-in-a-lifetime bargain basement price. But you? Well, you can buy as much of that Coca-Cola stock as you want. See the advantage you have? 2) Forced Redemptions - Mutual funds generally invest close to 100% of their cash inflows from investors. Because that's what their clients want. If investors wanted to earn a low rate of interest on their cash, they'd put it in a money market account, not an actively managed mutual fund. See the disadvantage in that? With 100% of its cash invested, a sharp increase in shareholder redemptions forces a fund to sell some of its holdings in order to pay off the redemptions. On the flip side, a sharp increase in new cash inflows forces a fund to look for new ways to invest cash quickly. Because redemptions markedly increase during market downturns, meaning fund managers are forced to sell at low prices. Meanwhile, large infusions of new cash markedly increase in bull markets, when stock prices are at their highest. The exact opposite of what most investors cite as the key to investing success. 3) A Short-Term Mentality - The weight of Wall Street's unrealistic short-term performance expectations drives most mutual fund managers out of the business. Due to fierce competition for investor cash, fund companies place undue emphasis on the current quarter's results. The net effect is that patience is rarely rewarded. Most mutual fund companies simply won't let a fund manager underperform the market for several consecutive quarters, even if his decisions have excellent long-term prospects. To keep shareholder redemptions at bay, fund companies fire managers who underperform the market in the short-term, even though many of those managers are quite capable of beating the market by substantial margins over the long-term. The result of such short-sighted thinking? It fosters a "win now" culture which rewards managers for chasing after the highest short-term returns, ultimately at the expense of the long-term. After all, they'll generate plenty of fees throughout this process. It's unsuspecting investors who are the ultimate losers. Knowing that 80% to 90% of actively managed mutual funds fail to achieve returns at least equal to the market averages, why would you invest in one? Investing in an actively managed mutual fund puts your Roth IRA retirement plan at an immediate disadvantage. If you aren't willing to invest the time and effort necessary to build your own portfolio of common stocks, that's perfectly understandable. But actively managed mutual funds are NOT the answer. Instead, seriously consider investing your Roth IRA in a market index fund or an exchange traded fund (ETF) which tracks one of the broader market indices. You can be absolutely certain you won't underperform it. Actively managed mutual fund investors simply can't make the same claim.